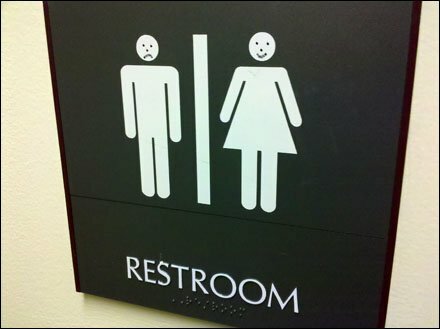 I could not figure out by who or why the female avatar on this restroom sign has been graffiti-ized as happy, and the male avatar as depressed. Maybe modern women have adopted the formerly male behavioral trait of checking out their opposite in a unisex environment? And barely visible at the bottom is the sign’s Braille legend. I could not decipher the mood of that participatory demographic group. SEARCH “Amenity” for items relating to customer comforts.